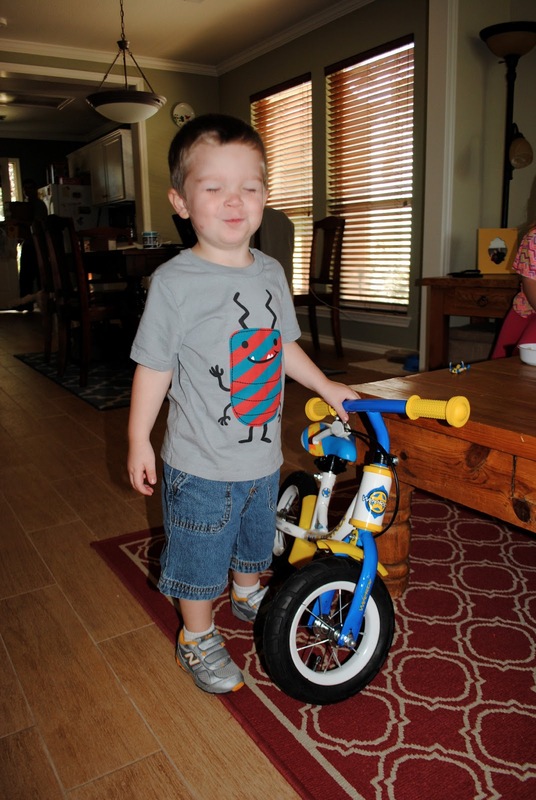 The Warrens: Matt's 3rd Birthday!! It's not quite his birthday (23rd), but we had a cake for him on Saturday and he got to open his presents. I seriously cannot believe he's already 3!! 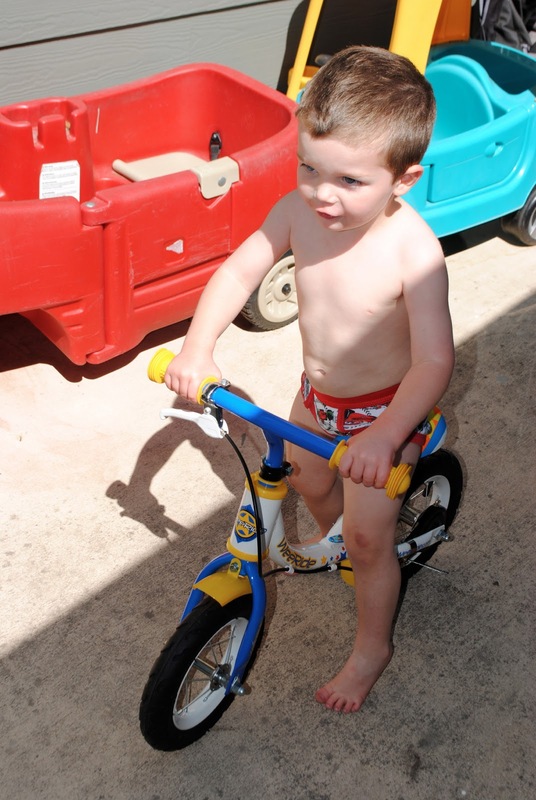 We got him a balance bike. He's not too fond of it yet. It's a about an inch too tall and the sad thing is that it's for 1 1/2 to 4 year olds. He's pretty short. More presents from Mom and Dad. He played with this thing for 3 hours straight, no joke. Opening the box from Aunt Kim, Uncle David, Ryan, Ashley, Henry, Parker, Dallas, and 'lil Henry. There was some awesome stuff in there! Thanks guys. He immediately wanted to put on the new outfit and he was very excited to have basketball shorts. That backpack is pretty awesome too. He usually prefers to be naked, but since we were taking birthday pictures and we were outside, I talked him into putting on underwear. He has been super into pirates lately, but he really wanted a Cars cake. It was just us, and Sam (he's taking the picture) but it was still fun. Isn't this awesome on the rare occasion that it happens? We decided this morning to take the kids to Sea World. We may only have a few months left in San Antonio, so we decided to take advantage of the nice weather and spend the day with the fish. 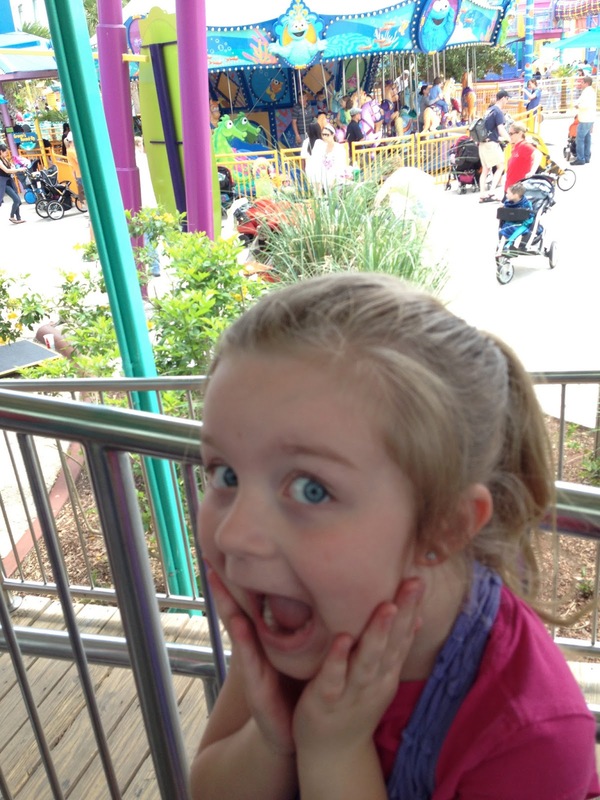 She is reenacting her surprised face. When we were driving there I was afraid she'd see the road signs (she's reading everything these days). We got lucky and she didn't even notice till we drove in and she said she was glad we didn't drag her to the store. Matt loved the sea lions. There was one (the big one) that kept barking for fish. Matt thought he would bark back. It was pretty cute. For some reason, these are the only characters Samantha can manage to get a picture with. And he almost made it :) I would say he had a pretty awesome birthday weekend. Thanks to everyone that sent cards and presents. We'll have to take him on a mini shopping spree this week.